Overlooking the Omaha skyline, the Nebraska Christian College campus in Papillion spans 80 acres of land with more than 60,000 square feet of classrooms, dorm suites, our student center, the cafeteria and faculty and staff offices. There are also two four-plex apartment buildings for married students. The state-of-the-art Ministry Equipping Center has a 500-seat auditorium, as well as classrooms, practice rooms, video/audio editing suites, a preaching lab, and a coffee bar. With a population of nearly 20,000, Papillion has been ranked #2 on Money magazine’s “Best Places to Live” list. Bloomberg Businessweek magazine named Papillion as the best place in Nebraska to raise kids. 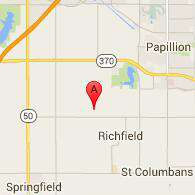 The 80-acre NC campus is nestled in the beautiful town of Papillion, just 2 miles south of Highway 370. For years the campus had only been accessible via a gravel road, which is currently being paved. Due to the construction, please allow an extra 10 minutes of travel time.